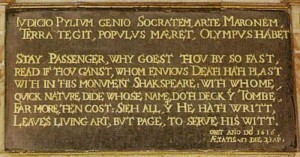 This line begins the English verse beneath the figure of Shakespeare on his monument. It was designed to draw attention to the grave of Shakespeare “with whome, quick nature dide”. Ironically, for hundreds of years visiting the grave of Shakespeare has become the main, if not the only reason for going inside Holy Trinity Church in Stratford-upon-Avon. One estimate is that 200,000 people a year do just that. There must be thousands of others who look at the church from the outside. It’s a beautiful building, in a lovely setting some way away from the town centre. Its terrace in the churchyard is a peaceful place to sit, enjoying the view across the river to the open recreation ground beyond. But the emphasis on Shakespeare and the pressure of tour schedules means that most of the visitors don’t give the church or its surroundings the attention it deserves. 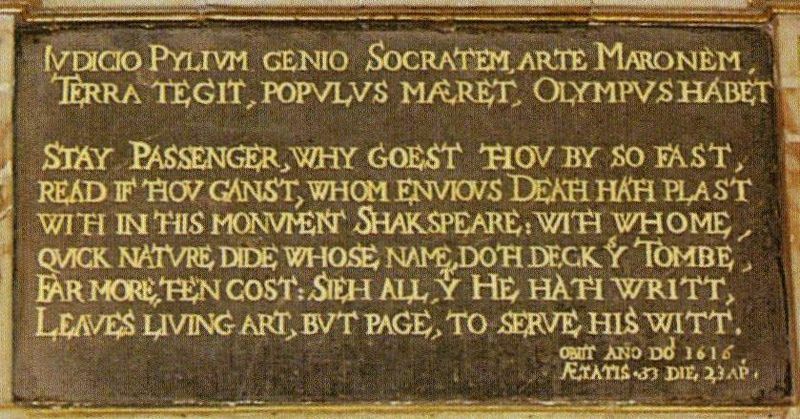 Passengers need to be encouraged to stay to look at the rest of the building, not just Shakespeare’s tomb. The Friends of Shakespeare’s Church is seeking to redress this balance by setting up a series of lunchtime talks about the building, its history and conservation. These are timed for Wednesdays from 6 November. They’re designed to fit in with lunchtimes, with each event beginning at 12.30, the talk lasting no more than 30 minutes from 12.45-1.15, and a sandwich lunch provided as an optional extra. The lecture series is entitled A Taste of History, and full information is available on the Friends of Shakespeare’s Church website. The lectures are free, but donations are encouraged. The money raised will help to take further the work of conservation and restoration of this historic church. The first talk on 6th November will be by Stephen Oliver, our Church architect, who will tell us how the history of Holy Trinity feeds into our conservation work. Stephen will thereby lay the foundation for the remaining talks and explain why we do what we do. Next up will be David Odgers (13th November), the conservation specialist who did such a wonderful job conserving the Clopton Chapel, and who told us about his work so engagingly. This time, David will discuss and point out the conservation work he’s just finished on the memorials in the Chancel, including the bust of William Shakespeare and the tombs of Dean Balsall (or Balsale) – mutilated as it is – and of Shakespeare’s friend John Combe. The third, excellent, speaker will be Mairi Macdonald on 20th November. Mairi’s topic is the Guild of the Holy Cross and its relations with, and presence in, Holy Trinity. There were tensions between the Guild and the Church, not quite amounting to fisticuffs but strong-minded nonetheless. Yet the Guild maintained two chapels in the Church and contributed to our services. No one knows as much as Mairi, as the editor of The Register of the Guild of the Holy Cross, Stratford-upon-Avon, about the Guild and the Church. We’ll live and learn. The final two talks will be given by Robert Bearman (27th November and 4th December). Robert will talk first about ‘The Shakespeare Family Gravestones and what they tell us’, a topic of unfailing interest not to say controversy. His second talk will be about St Peter’s Chapel – with its rich history and potential beauty – as well as the South Aisle and the Beckett chapel. Robert, as former Head of Archives and Local Studies at the Shakespeare Birthplace Trust will stimulate a great deal of interest, you may be sure, in these sometimes overlooked but richly historic areas of the Church. All the speakers are experts in their fields and are sure to bring to light unknown details of the church’s history. You’ll learn more about this ancient, important building, and incidentally it will be a great way to spend your lunchtime. 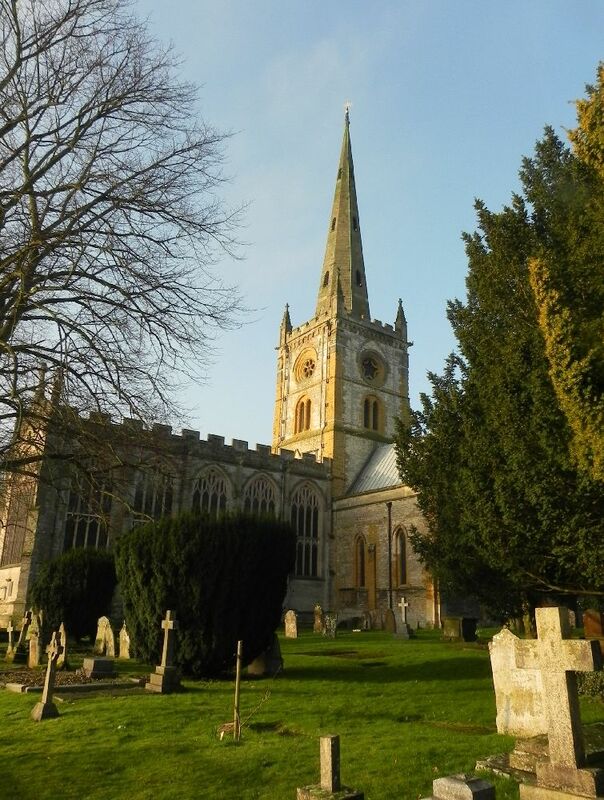 This entry was posted in Legacy, Stratford-upon-Avon and tagged conservation, Friends of Shakespeare's Church, grave, Holy Trinity Church, Mairi Macdonald, Rober Bearman. Bookmark the permalink. …maybe FOSC should establish links with the Churches Conservation Trust- and also introduce a small charge for guided tours.